f I had to buy a car today (and quite thankfully I don't) I'd get a used Landrover Defender 110. The one with the full-size spare tire on the hood, the luggage rack on the roof, and the extra gas can on the rear door. 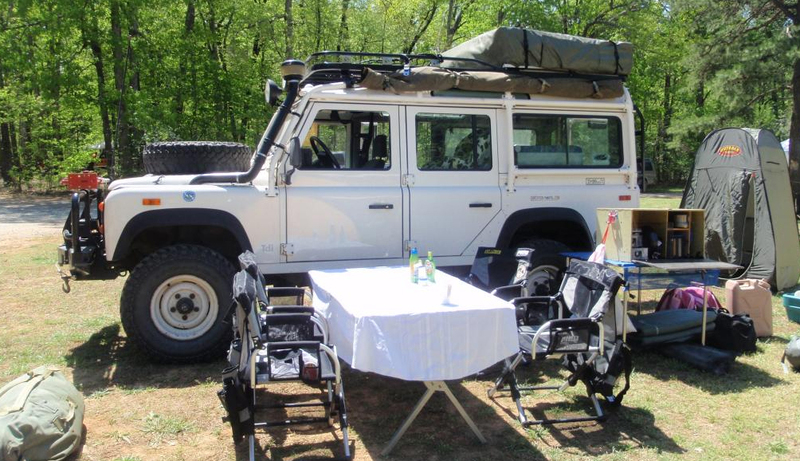 It has a diesel engine, solid metal doors, 4-wheel drive. It's not comfy, it's not quiet, and it's not cheap, but it is so obscenely practical it might even make my parents proud. It's rugged practicality that would look out-of-place and be utterly wasted in the city I live in. Shame. One day when I get out to the country I'd like to make this a reality. The whole vehicle says "adventure". In the meantime, I've been exploring the world of motorcycles - something infinitely more versatile here in New York. 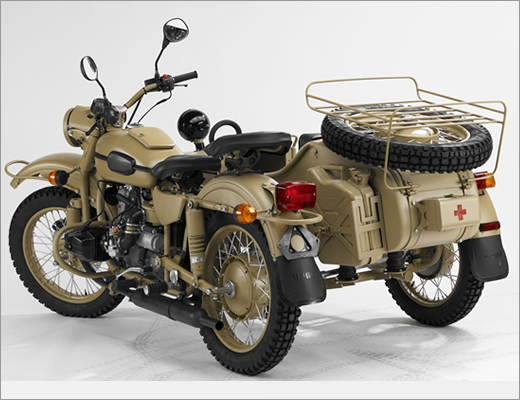 In digging around, I came across the Ural Sahara, which is nothing short of the Landrover in motorcycle form! It looks to be a limited edition available in 2009. British tan in color, it is a 750cc motorcycle complete with sidecar. What's particularly interesting is that the sidecar wheel is also driven by the engine, making it a 2-wheel drive bike. Yes, it has a full-size spare tire. Yes, it has an external gas can, two in fact. Yes it has a luggage rack. 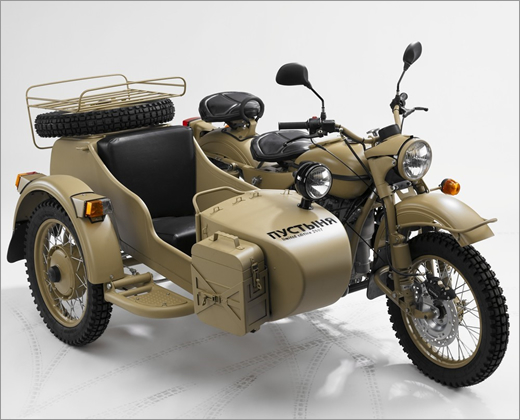 It also comes with a army-style trowel attached to the cycle-facing side of the sidecar, so you can dig yourself out when the 2WD fails you in sand or snow. If that weren't enough, it also has a first aid kit mounted in the rear (let's hope it stays intact if you get rear-ended) and a spotlight mounted on the sidecar. While having a vintage style, there's plenty of power in the 40HP engine, and it has modern touches such as electric start and a front disc break. Living up to it's style, it has a kick-start backup and is fueled by carburetor, which means the engine will still run in the event the battery dies. Priced at about $15,500 it's a little on the expensive side. Unfortunately for me, a sidecar adds much hassle in the city in terms of parking, not to mention the fact that none of my friends would ever get into a sidecar. I'm hoping that's not a reflection of my driving.